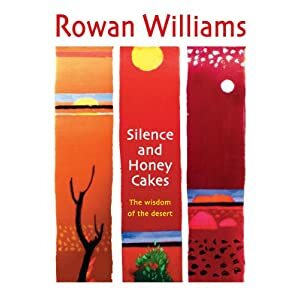 The Back of the Book (from Amazon): In Silence and Honey Cakes, Rowan Williams returns to the desert fathers and mothers of the fourth and fifth centuries, revealing a spirituality that resonates strongly with aspects of the modern spiritual search. Drawing on their stories and sayings, he reflects on questions such as: How can we discover the truth about ourselves? How do we live in relationship with others? What does the desert say about our priorities? How can we create a fearless community? NotJustLaura’s Review: I really felt quite lost reading this book. It is based on a series of lectures Mr Williams gave to an international organisation of Christian meditators. And this means it should have been right up my street. Unfortunately, I found myself cast adrift within the text as I didn’t seem to have a frame of reference with which to orient myself. Mr Williams spoke about the Desert Fathers and quoted extensively from their writing and then tried apply their teaching to the modern-day. I really didn’t understand a lot of what he said and couldn’t apply it to the world in which I live. Whether this is a deficiency on my part or on his I have no idea – I’m just thankful that this was a short book and not one on which I will ever be examined!